The Center for Negotiation Analysis (CNA) is a not-for-profit research institute established in 1993 devoted to studying, training, and providing practical advisory support concerning negotiations, mediation, and other forms of conflict resolution at the national, regional and international levels. The Center specializes in studying negotiation processes and translating them into practical, action-oriented training and recommendations for decision makers in government, business, civil society, and international organizations. The Center has conducted research studies, consulting assignments, assessments, field work, and training in Eastern and Western Europe, the Newly Independent States, Asia, the Middle East, and Africa. In recent years, the Center has conducted research on negotiating peace agreements while confronting corruption in developing countries emerging from civil war, negotiating with terrorists, post-agreement negotiation in international regimes, assessing the negotiation readiness of countries, and negotiating in an insecure world. The Center has also sponsored several policy roundtables for practitioners and analysts to disseminate the findings of negotiation research. These sessions have been conducted in coordination with the International Institute for Applied Systems Analysis (Austria), the International Studies Association, the International Association for Conflict Management, and the Johns Hopkins University. Since 1996, the Center has served as the Editorial Offices of International Negotiation: A Journal of Theory and Practice, published by Brill Nijhoff Publishers (Leiden). This thematic issue of International Negotiation (Vol. 18, no. 3, 2013) revisits the thesis introduced ten years ago in Spector and Zartman's book, Getting It Done: Post-Agreement Negotiation and International Regimes (US Institute of Peace Press 2003) that regimes are recursive negotiations and not merely one-off settlements that turn next to ratification. Seven cases are presented in this issue of the journal that highlight how and why regimes are marked by post-agreement negotiations. Over the years, the Center has received funding from the Jacob and Hilda Blaustein Foundation, Brill Academic Publishers, the National Defense University, the United States Institute of Peace (USIP), the United Nations, the International Institute for Applied Systems Analysis (Austria), the Swedish Institute of International Affairs, Battelle Corporation/Pacific Northwest National Laboratories, and the European-American Center for Policy Analysis/RAND Corporation (the Netherlands), among others. 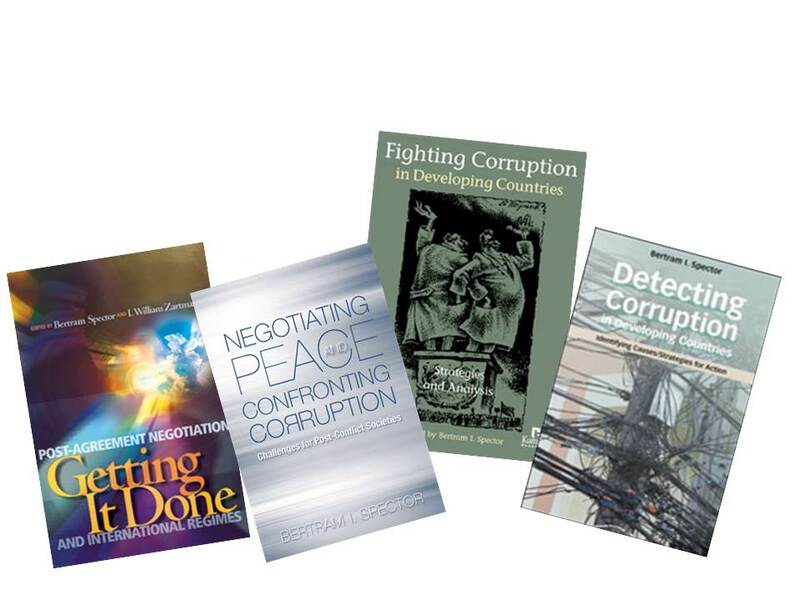 Negotiating Peace and Confronting Corruption is a new book authored by the Center's Executive Director, Bertram I. Spector, and published by the United States Institute of Peace Press in 2011. Spector argues that peace and economic recovery in post-conflict societies are more likely and more durable when good governance and anti-corruption reforms are included as central provisions in negotiated peace agreements and then implemented quickly, often with the support of international donor assistance. See the author discuss his book in the interview below. READ a new article on THE RIGHT TO NEGOTIATE: The assertion by NGOs of their “right to negotiate” with authorities is increasing, not only when dealing on the national level, but at international negotiation fora as well. It suggests an expanding democratization of the negotiation field – broadening the types of stakeholders participating. The Center for Negotiation Analysis is designated as a 501(c)(3) not-for-profit educational institution by the US Internal Revenue Service. Click here to contact the Center by email. Copyright © 2013 Center for Negotiation Analysis, Inc. All rights reserved.